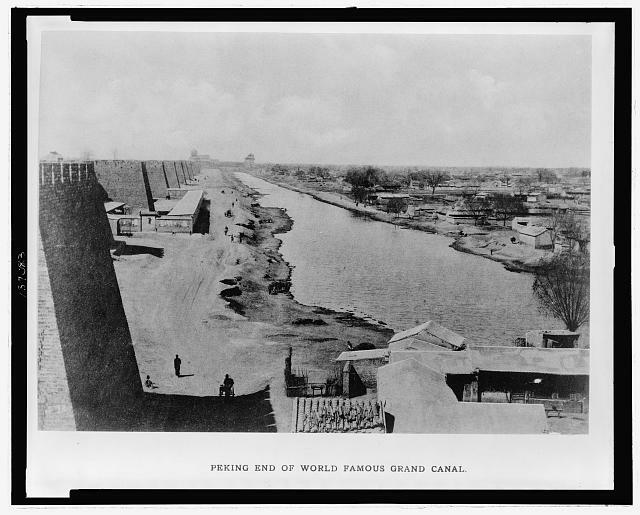 The Grand Canal, from The Library of Congress, at loc.gov. The Grand Canal of China is not only the world’s oldest canal, it is far longer than either Suez or Panama. At 1,795 kilometers (or 1,114 miles) it has 24 locks and 60 bridges, and claim to the title of longest canal. Building began in 486 B.C. with an important extension decreed in the third century, BCE during the Qin Dynasty. The Grand Canal, connecting China via an internal route, greatly improved not only defense but administration. It was the first Qin emperor in 221 BCE who standardized writing in China. Before this, each area had its own particular writing system. But with the help of the connections made by the Grand Canal. the so-called Qin script became the official set of characters, required for all state and governmental affairs. This script made possible the governance of China, and region became a nation through standardized language uniting different, and vastly distant, areas. In this sense, the Grand Canal with the addition of Qin script was the internet of its time. Kublai Khan, by Liu Kuan-Tao ca. 1280 CE from the Collection of the National Palace Museum, Taipe, from Michigan State University, at msu.edu. It was Kublai Khan, (grandson of Genghis Khan, the ruler who ordered the excavation of a direct waterway between his newly founded city of Dadu – today’s Beijing – and Hangzhou) who, when he became emperor, directed grain be transported to Dadu. 816,000 tons of grain were delivered annually, the major share – 537,000 tons – coming from the south via sea or the canal. But the canal stopped short of Dadu. So the grain had to be offloaded and piled onto carts pulled by draft animals conscripted just like soldiers. As a result, local farmers could not plow their fields and agriculture suffered. To make matters worse, many animals died along the route. And so it was failure that led Kublai Khan to order the completion of the seventh and final section of the Grand Canal, straightening the route to make it more efficient, and enabling all of China to communicate with the new center of political and cultural life, Dadu/Beijing. Fulton, by the Circle of Thomas Sully, from Christies. It was in 1796 that an American engineer wrote, in “The Treatise on the Improvement of Canal Navigation,” that China became a great nation primarily because of the Grand Canal. He lobbied for the building of the first canal in New York, and inspired the eventual building of the Erie Canal. However, Robert Fulton is more famously known for building the first successful steamboat in 1807. “They’re going to turn the water around,” explained an oarsman interviewed in the year 2000 who lives on a barge floating along the Grand Canal in Jiangsu province. The flow of the Grand Canal will be changed from south to north, and in some places it will change from downhill to uphill. Why? To provide water to northern China. Half of the population of China now lives in the north, but that region has only 1/5th of China’s water. The estimated cost for the first phase is $22 billion. According to experts’ calculations, this megaproject will be the largest of its kind ever undertaken. When completed (in the year 2050), the massive renovation of the ancient Grand Canal will move 44.9 billion cubic meters of water annually. Can the Grand Canal contribute to the recent water-resourcing challenges in China? Droughts and floods prompted the United Nations Secretary-General for Disaster Risk Reduction to express concern regarding conditions affecting 230 million people in China. These are translations of a few of the earlier (although still about a thousand years into the project) imperial decrees for the creation and extension of parts of the Grand Canal. -From Ruifang Liu, The History of Chinese Emperors ([Beijing ? ]: National Defense University Publishing House, n.d.) 304-5. The Future of Water: The Grand Canal provides China’s water resources — for navigation and irrigation. When the 2008 Beijing Olympics threatened to stress the water supply, China hastened Canal improvements. How should decisions concerning shared water resources be made? Will findings of the international conference: “Rebuilding Sustainable Communities after Disasters in China”(http://www.umb.edu/crscad/events/china_2012) convened at the University of Massachusetts Boston provide guidance regarding alleviation of water challenges including flooding and drought? Can the Grand Canal inspire solutions? Commerce and Success: The Grand Canal transformed China from a region with separate languages and customs into a nation. A shared central passage facilitated government, communications, even China’s first standardized language and script. During the Qing Dynasty (1644-1912), the Grand Canal was opened to commercial enterprise, The distinguished Institute for Qing History of Renmin University (http://qss.ruc.edu/cn/) might enlighten policy regarding the Grand Canal’s contribution to China. Can the Confucius Institute (www.umb.edu/confucius/) lead the discussion of the Grand Canal in China’s inspiring history and exciting future? The Grand Canal of China, South China Morning Post Ltd, New China News Ltd: Hong Kong, 1984. ISBN: 962 10 0025 4. Folder does not contain entire book. “They want Genghis Khan to have his due, statue, too,” Washington Post, date of article not known. File contains copy of article with painting depicting Genghis Khan. Ennin’s Travels in T’ang China, by Edwin O. Reischauer. New York: The Ronald Press Company, 1955. The Grand Canal of China, by Lyn Harrington. Rand McNally, 1967. File with additional book sources including works by Joseph Needham. “On Lu Kou Canal,” “On Thung Hui Canal,” also two sources on Great Wall, researched by Lin-lin Ju. Folder contains English translations and original Chinese text. “Hydraulics:” with figure 882 plot of the number of hydraulic engineering works undertaken in successive dynasties (data from Chi Chhao-Ting). Source unknown. “The Chinese Model for America’s Canals,” by Anton Chaitkin, American Almanac, 1989. http://members.tripod.com/~american_almanac/canal.htm. “The Mongolian Empire: The Yuan,” by David W. Koeller. “Global firms thirst for China’s biggest canal project,” China Internet Information Center, Xinhua News Agency, 11/20/2000. www.chinapage.com/canal/html. “China’s Grand Canal Queues for World Heritage Status,” China Internet Information Center, Xinhua News Agency, 07/06/2004. “Ssu-ma Kuang (Pinyin Sima Guang) compiled general chronicle of Chinese history from 403 BC to AD 959” Encyclopaedia Brittanica. “Books of the Twenty-Four Histories” a collection of historical books covering period from 3000 BC to Ming Dynasty of 17th century. This source lists the books and their dates. “Beijing invites design to revive Grand Canal,” Xinhua News Agency, People’s Daily Online. http://english-people.com.cn/200402/23/eng20040223_1354. “The Grand Canal of China” illustration of navigational lock, and port city of Changzhou, Jiangsu Province about 150 Km northwest of Shanghai.